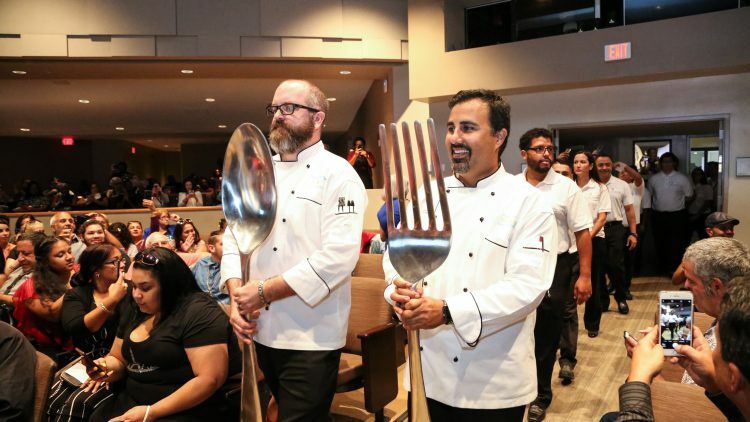 MDC’s state-of-the-art Miami Culinary Institute (MCI) officially inducted a new class of aspiring chefs who received their chef’s coats at a special ceremony on Monday, Sept. 17, at Wolfson Campus in downtown Miami. The 65 chefs-to-be are one of the largest incoming fall semester classes to date. This year’s keynote speakers were Wendy Kallergis, President and CEO of Greater Miami and the Beaches Hotel Association, and Aaron Brooks, Executive Chef, Edge Steak & Bar at the Four Seasons Hotel. MCI’s Chef’s Coat Ceremony marks the beginning of the students’ journey toward achieving an Associate in Science (A.S.) in culinary arts management and becoming a part of Miami’s dynamic gastronomic scene. Building on MDC’s rich history as the largest institution of higher education in the country and one of the most celebrated colleges, the Miami Culinary Institute provides students a recipe for culinary excellence in the 21st century. Mixing a blend of classic skills and innovative techniques used by the world’s best chefs, Miami Culinary Institute offers an educational experience that is at the forefront of the industry. Through a focused infusion of green-sustainable food and energy technologies and best practices, nutrition and culinary knowledge, its aim is to create professionals who will evolve the world’s food culture.